In 2015 it’s been nothing more than an artful sweep across a drawing board, a simple curve signaling both exotic form and the possibility of borderline insane function. Today, though, that vision became drop-dead gorgeous reality as the covers were pulled off the remarkable Aston Martin-Red Bull Racing Valkyrie Hypercar. 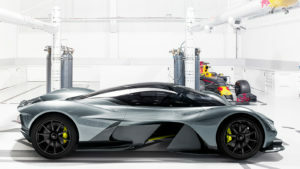 Designed to be the ultimate fusion of eye-popping beauty and brutal power, the Valkyrie is the brainchild of the legendary Adrian Newey, Marek Reichman, Aston Martin EVP and Chief Creative Officer and David King, VP and Chief Special Operations Officer and together they’ve come up with a world-beating machine the like of which has never been seen before. 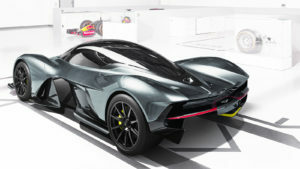 While the full technical specification of the world’s newest and most radical hypercar weren’t released at today launch at Aston’s HQ in Gaydon, UK, the team and the car manufacturer teased some details by announcing that the mid-engined beauty will be powered by a naturally aspirated V12 engine and that the car’s F1-inspired carbon fibre construction will give it a power to weight ratio of 1:1, 1 bhp per kilo of weight! In short, the Valkyrie is to feature performance levels in line with that of today’s LMP1 Le Mans sports prototypes! Fellow designer Marek Reichman added that the major goal of Aston Martin’s collaboration with Red Bull Racing was to find “that magical tipping point where we achieve the most efficient engineering solutions and the most beautiful styling solutions without any compromises”. “By definition the objectives we’ve set for the car ensure there has never been an Aston Martin – or any car, actually – quite like the Valkyrie,” he said. “My personal challenge has been expressing the Valkyrie’s extraordinary performance and the unique way in which it delivers that performance. Its style reflects its revolutionary nature, while possessing the form and beauty that makes it unmistakably an Aston Martin”. David King, Aston Martin’s VP and Chief Special Operations Officer, adds: “Working at Aston Martin means you get to be a part of some truly special projects, but the Valkyrie is a dream – a true once-in- a-lifetime opportunity. Of course it’s a huge engineering challenge, too, but the game-changing objectives of this programme have a uniquely energising effect on everyone involved.” The Valkyrie has already captured the imagination of connoisseurs across the world and the customer list for the 99-150 road cars and the even more radical 25 track versions reads like a who’s who of F1 legends, moguls and megastars. It’s a sentiment echoed by Aston Martin’s President and CEO Dr Andy Palmer. “The Valkyrie is a truly remarkable project and something of which I’m extremely proud. To have Aston Martin working alongside Adrian Newey, Red Bull Racing and the invaluable assistance of project partner AF Racing AG is an extraordinary creative collaboration. One that unites the very best of road and race car thinking. 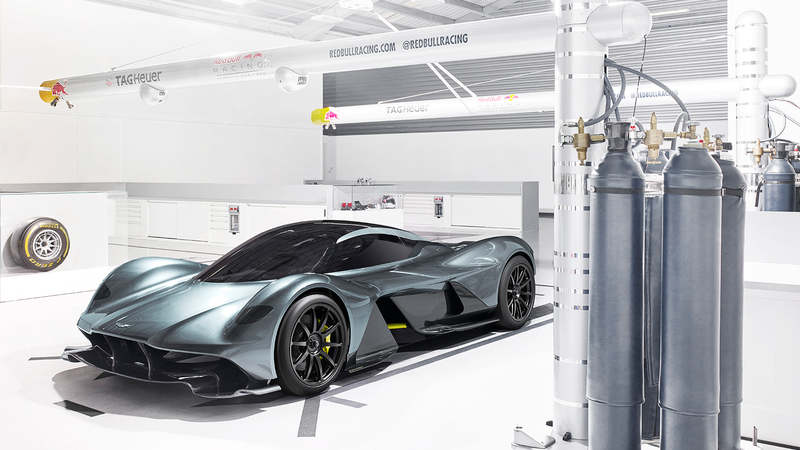 “As the project gathers pace its clear the end result will be a truly history-making hypercar that sets incredible new benchmarks for packaging, efficiency and performance and an achievement that elevates Aston Martin to the very highest level,” he added.